Jenson Button (GBR) McLaren and Sebastian Vettel (GER) Red Bull Racing on the podium. Formula One World Championship, Rd 12, Belgian Grand Prix, Race, Spa-Francorchamps, Belgium, Sunday 28 August 2011. Winner Mika Hakkinen(FIN) Mclaren MP4-15 Belgian GP, Spa, 27 August 2000. Winner Alain Prost(FRA) Mclaren MP4-3 approaches Eau Rouge. Belgian GP, Spa, 17 May 1987. Pedro Rodriguez (MEX) takes the flag to win in his BRM P153 Belgian GP, Spa, 7 June 1970. An enthralled crowd watch the race action from the start/finish straight. Belgian Grand Prix, Spa-Francorchamps, 18 June 1961. Belgium's Spa-Francorchamps circuit is among the most historic on the Formula One calendar, having hosted a (non-championship) Grand Prix as long ago as 1924, and remains one of the most popular venues with drivers and fans alike. Run on narrow public roads, the original Spa layout was an amazing 14.9 kilometres long and notoriously dangerous. The lap distance was reduced slightly over the years, with some corners eased, but when the 'old' circuit staged its final Grand Prix in 1970 it still measured just over 14 kilometres and remained staggeringly quick - Chris Amon set that year's fastest lap at an average speed of just under 245 km/h. Spa did not return to the calendar until 1983 and then in drastically revised form, with lap distance cut to just under seven kilometres. Somehow, though, the circuit's magic was retained. Around two thirds of the lap used the original layout and the legendary Eau Rouge corner remained intact. Only the new Bus Stop chicane on the run down to La Source drew criticism. The weather is still notoriously changeable (it can often be simultaneously raining on one part of the track and dry on another) and Eau Rouge, with its high speed and sudden elevation change, maintains its reputation as one of Formula One racing's most technically demanding corners. Such is the challenge of Spa that only the truly great drivers can really claim to have mastered it. In fact just six men have won the race more than twice - Juan Manuel Fangio (three times), Damon Hill (three times), Kimi Raikkonen (four times), Jim Clark (four times), Ayrton Senna (five times) and Michael Schumacher (six times). 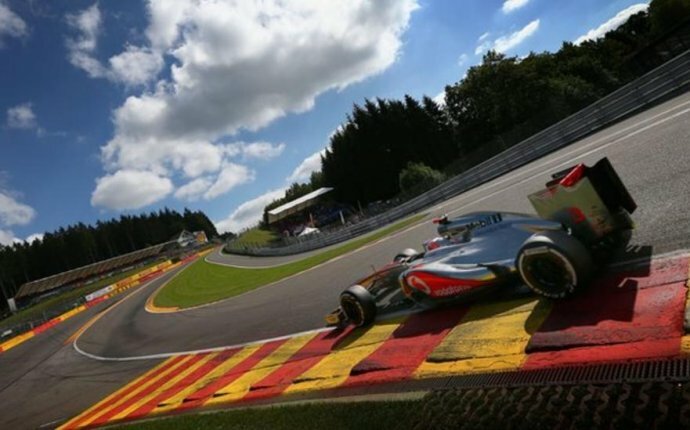 Formula One World Championship, Rd12, Belgian Grand Prix, Race Day, Spa-Francorchamps, Belgium, Sunday 24 August 2014. Fernando Alonso (ESP) Renault R29. Formula One World Championship, Rd 12, Belgian Grand Prix, Practice Day, Spa-Francorchamps, Belgium, Friday 28 August 2009.